At the end of the tutorial we show how the app can be deployed to the different target platforms. The conversion of the mouse coordinates in world coordinates is no longer correct. In order to avoid cutting off parts of the playing field, the picture should be fitted with a margin; see also Fit Picture with Margin (Letterbox / Pillarbox). Setting the two attributes fieldOfViewY="300" and aspectRatio="1" for the camera node would do the job but for training purposes we do the adjustment by our own in the logic code. We simply switch between the camera attributes fieldOfViewX and fieldOfViewY according to the current aspect ratio. The camera is used for the correct conversion of the mouse coordinates as well. The X/Y values of the mouse pointer are always within the range from -1 to +1. To convert these values, we have multiplied the value of the Y-coordinate by 300 so far. If the window is higher, the displayed area within in the virtual world increases. The correction value of 300 is thus no longer valid and therefore needs to be readjusted. For a simple conversion between screen and world coordinates the camera object provides the methods GetWorldPositionFromScreen() and GetLocalPositionFromScreen(). These methods need the X/Y-values and the camera distance as parameters. The distance towards the camera has to be specified as negative number, as the camera viewing axis runs along the negative Z-axis in the default coordinate system as discussed in the Cube tutorial. The method GetWorldPositionFromScreen() always delivers absolute world coordinates, regardless of the position or perspective of the camera. By using the method GetLocalPositionFromScreen(), it is possible to query the world coordinates relative to the camera. GetWorldPositionFromScreen() multiplies the values of GetLocalPositionFromScreen() with the transformation matrix for the camera. If the camera position is (0/0/0) and the perspective along the Z-axis is towards -∞, GetWorldPositionFromScreen() and GetLocalPositionFromScreen() deliver the same values. In our case, it is possible to use both methods. The position of the camera is (0/0/800) and it looks towards negative infinity. 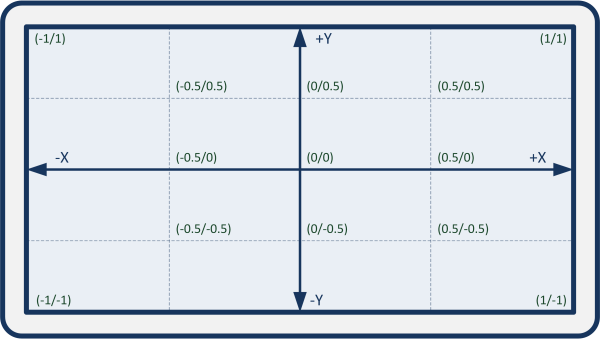 Therefore, both methods deliver the same values for the X/Y-position. The following code delivers the requested position values. The result confirms the assumption: The X/Y-values are identical, the Z-values, however, are moved by 800 units. Due to inaccuracies, which always occur when calculating with floating point numbers, the values for Z are not exactly 0 and -800. Therefore, it is recommended to manually correct the result after calculation. As we only need the Y-value, we use the method GetLocalPositionFromScreen() without correcting the Z-value. Again, we download suitable sound files from https://www.freesound.org . The wav files have a 32 bit float format and therefore need to be converted into an integer format (e.g. 16 bit PCM) before use. For this purpose, the free audio editor Audacity (audacity.sourceforge.net) can be used. The new files are added to the file package.xml, while the remaining sound nodes are packed into the files graph_sound_instance.xml and graph_sounds.xml (as in the Audio tutorial). In order to play the sound, we create two TimelineNode objects and two suitable methods. Finally, we add multi-touch support to the application. The object IAppConfiguration provides various methods in order to control the activation and deactivation of the multi-touch device. The Logic::IDeviceHandler's method GetNumberOfTouchDevices() determines how many virtual touch devices exist and how many fingers can be simultaneously recognized by the device. By using the method GetTouchPosition() the touch position can be queried with X and Y-values always ranging between -1 and +1. The Graph::ICamera's methods GetLocalPositionFromScreen() and GetWorldPositionFromScreen() then convert these values into camera-space and world-space coordinates, respectively. 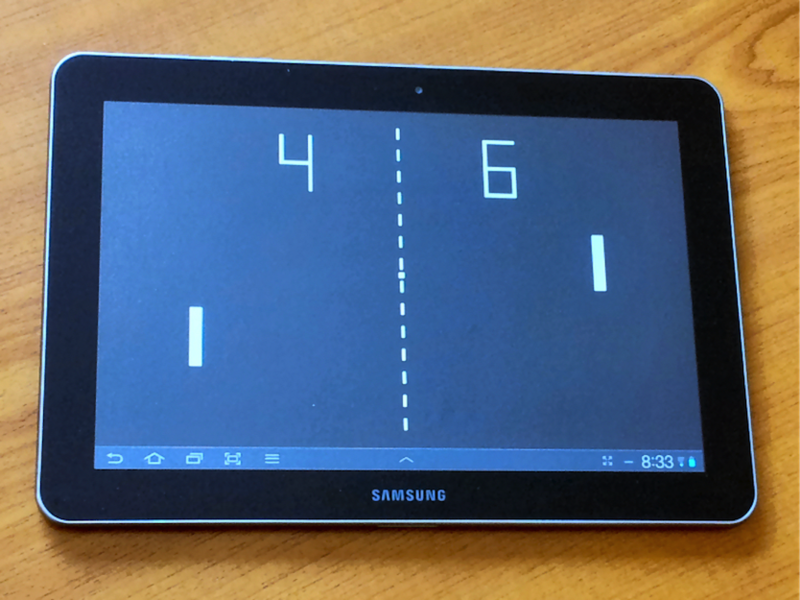 With these modifications, it is possible to play the game also on multi-touch devices. See the section Android Deployment below on how to build the app for Android devices. This section shows how the Pong game (and previous tutorials) can be deployed to all target platforms supported by the Murl Engine. So far, we have created all projects with the debug profile. In order to develop a release version for Windows, the compiler profile (configuration) needs to be modified. Available profiles are Debug and Release. 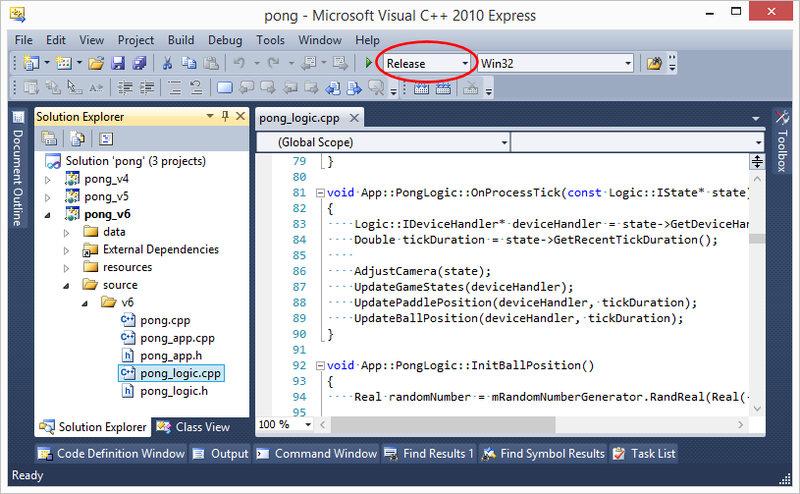 In order to edit the file in Visual Studio, we right-click the file in the Solution Explorer and choose "View Code". The first section of the code shows general information about the application. This information is adopted in the final application and can be displayed via e.g. right-click->Properties->Details. #define APP_COMMENTS    "Authors: Spraylight GmbH"
With IDI_APP_ICON ICON "murl.ico" the icon of the application is selected. In our case, we choose the file murl.ico. The icon is packed as graphic resource into the final application and shown as program icon. It is possible to create your own icon with e.g. the standard Windows program Paint. Alternatively, it is possible to directly add the Murl resource packages to the final application via rcdata. By doing so, all resources are packed into a single file and no other files (except for an .exe file) are necessary in the installation directory. We pack the startup and main package into the final application. Further information on the format of .rc files can be found in the MSDN documentation of Microsoft. The final application can be created in the menu via Build->Build Solution (F7). The application is located as .exe file in the sub-folder binaries/win32/ followed by the compiler version (vs2008/vs2010) and the name of our profile (in our case: Release). Besides the .exe file, also a .pdb file (pong_v6.pdb) can be found in this sub-folder. This file is a program database containing debug and project status information and is not needed to run the application. It can be either ignored or deleted. The .exe file can be run without installation and without any other program packages. If desired, an installer package can be made with any installation software (e.g. Inno Setup: www.jrsoftware.org/isinfo.php). The file can simply be edited with a text editor and is divided into logical subsections. Comments start with a # character. Most of the stated Android values are directly copied into the Android manifest file. The Android developer documentation contains further information about possible values - see developer.android.com/.../manifest-intro.html. The parameter MURL_ANDROID_PERMISSIONS defines the app permissions. We don't need additional permissions and therefore explicitly specify an empty value with "MURL_ANDROID_PERMISSIONS := ". Omitting this statement would be possible as well and would have the same effect. The next lines are commented out and only serve as an example of how to define multiple permissions. 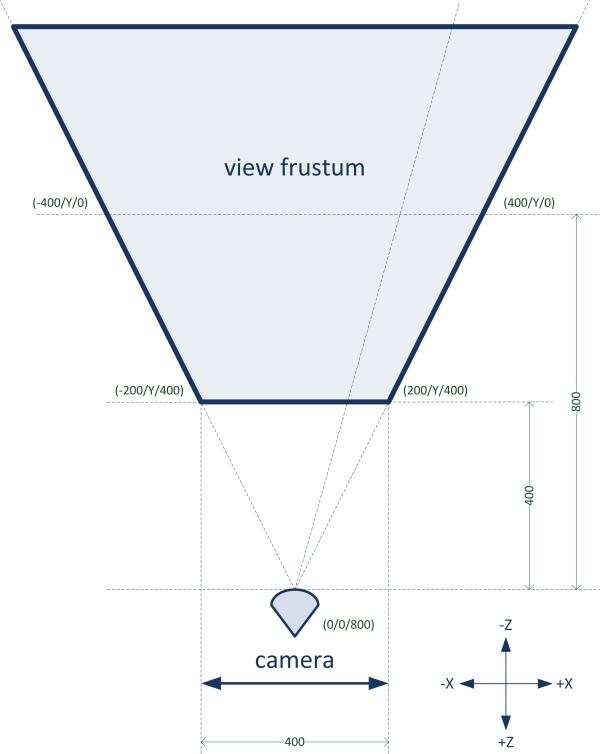 The parameter MURL_ANDROID_SCREEN_ORIENTATION defines the allowed screen orientation (see also developer.android.com/...android:screenOrientation). See also developer.android.com/.../ImageView.ScaleType.html for further information. Caution! Make sure to execute the Android->Clean All command when changing a setting for the splash screen to ensure that all files will be rebuilt. 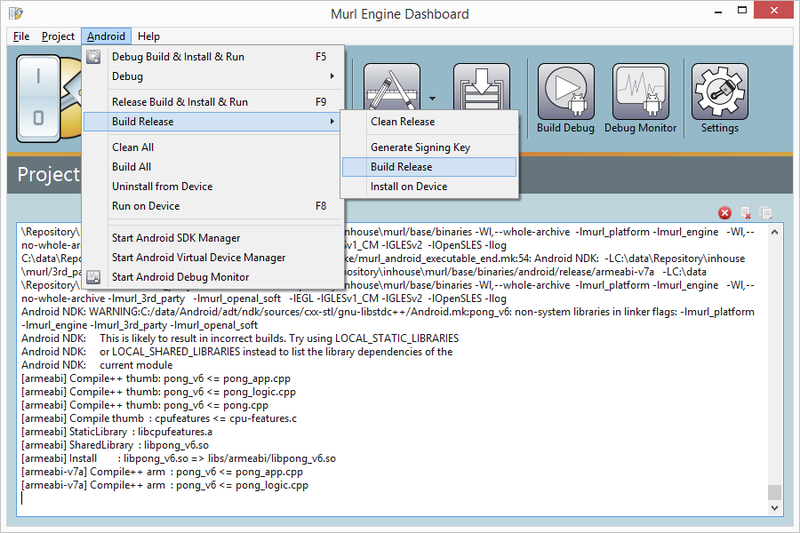 The parameters MURL_ANDROID_RESOURCE_PATH and MURL_ANDROID_RESOURCE_FILES can be used to specify the resource files. All specified files will be copied directly into the res directory of the .apk archive. Further information about Android resources and the possibility to specify alternative resources for different screen densities can be found on the Android developer website on page developer.android.com/...AlternativeResources. The easiest way to do an Android build is by using the tool Dashboard. The "Android" menu contains several commands to build Android apps in debug or in release mode and to install them onto Android devices. Alternatively the shell scripts in the directory project/android/gnumake can be used. The created key is stored as a .keystore file in the directory project/android/gnumake and is used for release builds automatically. Keep the .keystore file in a safe, secure place. You must use the same key to sign future versions of your application. If a signature key has been created, the Dashboard can be used to perform a release build. The final app can be found as .apk file in the directory binaries/android/release/v6. The .apk file can be uploaded and published in e.g. the Google Play Store. Besides the .apk file, also some sub-directories (armeabi and armeabi-v7a) containing some shared object files and archive library files can be found in this sub-folder. These directories and files are not needed to run the application and can be either ignored or deleted. In order to create a release build, the "Build Configuration" needs to be changed from Debug to Release. All further iOS resources like the icon images, the launch image, the artwork file etc. are also located in the same directory. See developer.apple.com/.../App-RelatedResources.html for further information. During development usually Murl resource directories are used. When doing a release build, however, binary packages are the better alternative. Hence we add the "Target Membership" for the file main.murlpkg and remove it for the folder main.murlres. All bundle resources can also be changed in Project Settings -> Build Phases -> Copy Bundle Resources. The menu command Product -> Build can be used to create a release build. The application file can be found as .app bundle in the folder binaries/ios/Release-iphoneos. The resource packages are included in the bundle and can be verified using the Finder menu command Show Package Contents. If a iOS developer device (provisioned for development) is connected to your computer, you can build the App and install it to your device by pressing the run button ("Build and then run the current scheme"). You can use Xcode to upload your Murl App directly into the Apple App Store. More detailed information can be found in the App Distribution Guide from Apple. The build process for building OS X applications is very similar to the build process for building iOS apps. 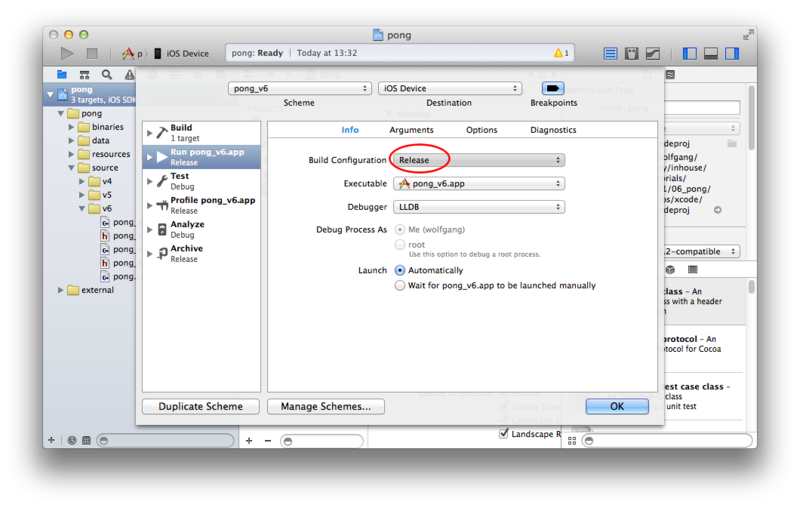 In order to create a release build for OS X, the "Build Configuration" needs to be changed from Debug to Release. 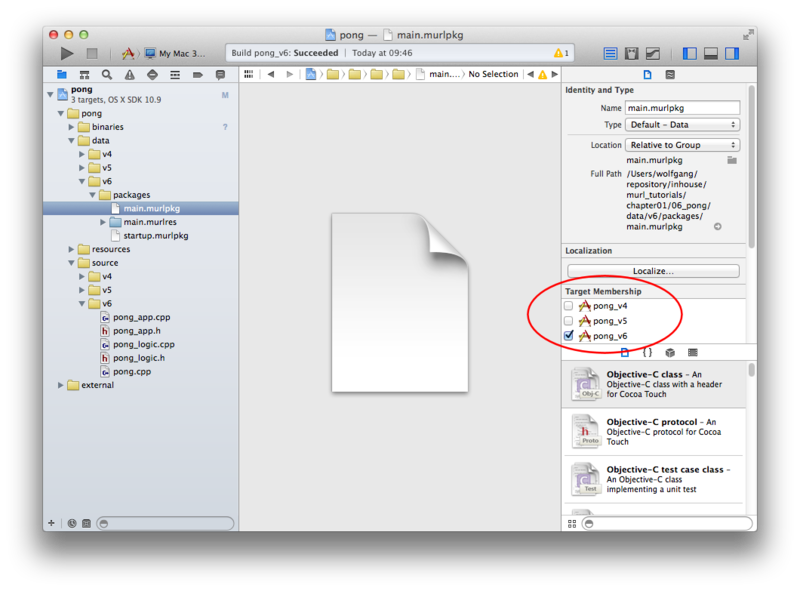 Also the App Icon file is located in the same directory (resources/common/osx/Icon.icns) and can be changed if needed. Additionally the file Credits.rtf is available in the directory resources/v6/osx. The file contains the information the user sees when choosing About. During development usually resource directories are used. When doing a release build, however, binary packages are the better alternative. Hence we add the "Target Membership" for the file main.murlpkg and remove it for the folder main.murlres. The final application can be created in the menu via Product -> Build. The application file can be found as .app bundle in the folder binaries/osx/Release. The resource packages are included in the bundle and can be found in the subfolder Contents/Resources. The Finder menu command Show Package Contents can be used to verify if the right resource packages have been added. 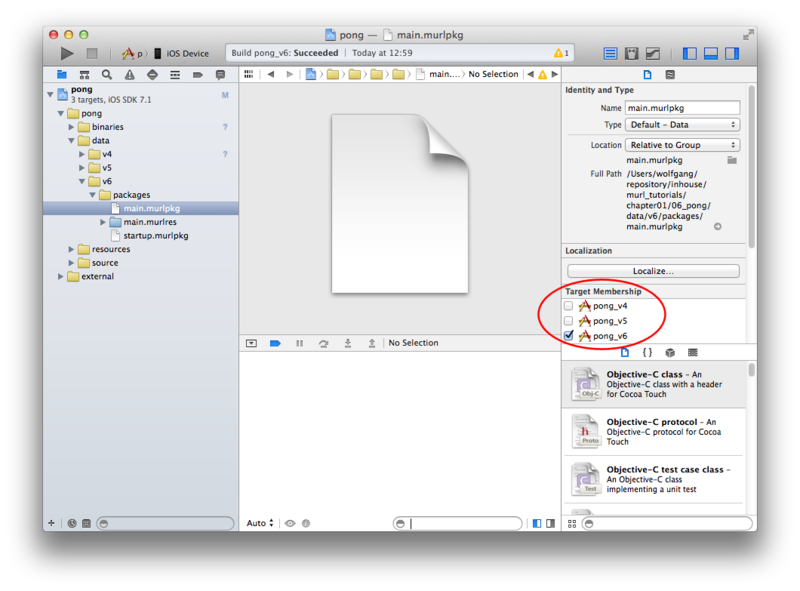 Besides the .app file, also a .app.dSYM file can be found in the release folder. This file contains debug symbols and is not needed to run the application. It can be either ignored or deleted. Information about the submission to the Mac App Store can be found in the Mac developer documentation on page Submitting to the Mac App Store.